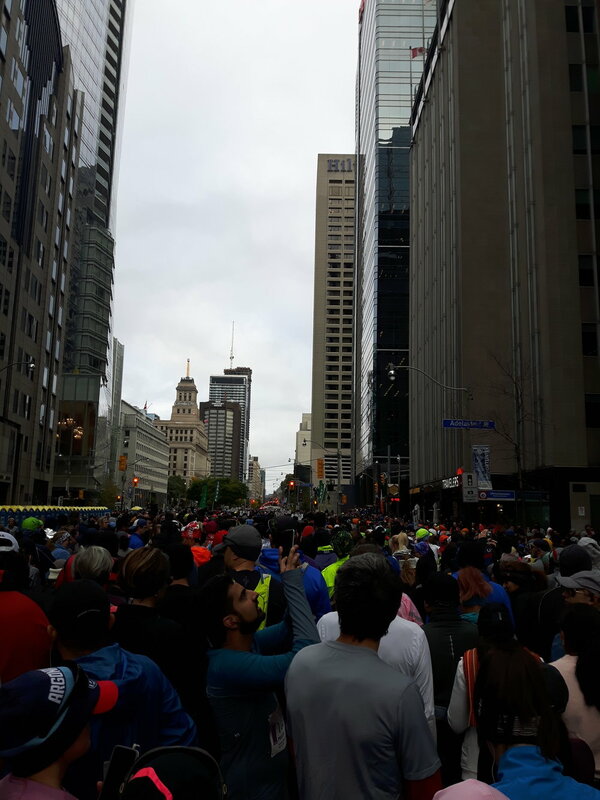 Running the Scotiabank Toronto Waterfront Marathon on Sunday was the best thing I’ve ever done in my entire life. Hands down. Maybe there are bigger, better things ahead of me—maybe someone I love will need a kidney. Maybe I’ll change lives. Maybe I’ll reinvent cauliflower BUT right now, conquering 26.2 miles takes the cake. Alllllllll of the cake. With extra frosting. Finishing the marathon was everything I had dreamt of—and then more. And while, yes, I am essentially saying that the best thing I ever did was join a human herd chasing a free banana… a marathon really isn’t ever JUST a marathon—here’s why. Prior to the 16-week commitment of marathon training, when I was training for a race, I was RIGID about my running schedule. If it was written down, I was lacing up. It didn’t matter if I was hungover (oop), or had work to do, or it was a dangerous 42 degrees with humidity, I was going out to make it happen. This kind of stubbornness often had me running on fumes or missing my own life. BUT, during marathon training I was running frequently enough that it became another thing on the to-do list. Some of that sacred sheen of “the run” went away. That meant I could shuffle Saturday’s run to Sunday if I wanted to stay out late and sleep in the next morning, or even skip a maintenance run during the week without a blink—like I did when my niece was born. Running more basically taught me the value of running flexibly. That being SAID, taking on a distance this big meant slacking was NOT an option—so sometimes getting up at 4:30 a.m. to run 30 km before a 3 p.m. wedding on the same day had to be done. Then I did it, and loved being able to do both. After the run, when I finally got to shower, I had to take a second to marvel over my feet, my calves, my thighs. I had to acknowledge that the things I wanted, and the things I loved were, and are, all within reach of my (chubby) arms. I didn’t need to drop x number of pounds to make my dreams come true. I had done it—in my body, on my terms. After months of hard training and uncertainty and anxiety about finishing times, reaching 26.2 was solid affirmation—I’m strong. I’m capable. I made my dream happen—therefore, my current body is a dream body. Worthy and awesome. That’s a feeling I’ve never exactly had before. When I got home, I cranked the tunes and danced while putting my sweaty smelly gear in the laundry basket and packing my work bag. I got to celebrate just a little bit more of what I’m capable of—which feels like pretty much ANYTHING right now, honestly. Bonus: I got my period the MORNING of the marathon, so finishing with THAT piled on made me feel strong as h*ck. When you run far enough, by the time you get to the finish line, you’re nothing but who you are: there’s just nothing else left. Your pretensions or postures are gone, anxiety has evaporated, and you’re exactly who you’re supposed to be. Also, the volume of the rest of your life has turned down—yeah, like Fight Club with less explosives. Both on and off the course, running this marathon has shown me just how wide and wonderful and supportive my personal circle AND the running community is. So many people—even many who I barely know—sent me kind words of empowerment and guidance before the run and heartfelt congratulations after. I was fortunate enough to have loved ones were waiting for me at the finish line—there’s nothing quite like crying and sweating all over your family in sweet, sweet victory. During, I witnessed the living nature of the race and the community itself. I saw all kinds of people of all ages. At 35km, a man saw my name on my bib and yelled, “you’re doing great Riley!” and for a few brief seconds, my body stopped aching. At kilometre 37, the woman in pink I had been keeping pace with silently exchanged a grin and a thumbs up with me. At 38 km, a volunteer flashed me four fingers, quietly sending me encouragement—only 4 km to go. The world itself had my back. I was a part of something, and it helped me realize I’d like to be a bigger, more involved part of that incredible something. Normally, I’m a bit of a hermit or a stray dog (the less-cool lone wolf) when it comes to running. Now I’m beginning to realize part of what might make the sport even more worthwhile is being able to share it. …And They Gave Me A Medal! Last but not least, I got a shiny piece of metal that proves I did the thing. And I like this shiny piece of metal so much, I might do the thing again. Please note my ACTUAL TEARS.